In the quiet moments, when we stop to take a breath and think, we may realize that all of our thoughts, our questions, our hopes, are connected—that is to say, back to two main ideas: Where am I going? and Where have I been? Again, as if to say something toward longevity, What am I leaving behind? How will I be remembered? Whether or not we want to admit our involvement with these questions, they are always there, always looming, and they impact where we go, who we become, and even how we perceive where we’ve come from. They impact what we do and what results from what we do. The irony of this is that not all things can be controlled, nor left to chance, but the same way we are sometimes challenged to perceive all of our decisions relating back to those two opening questions, we are sometimes motivated to prove the opposite. We want to prove our actions can be impulsive and unrelated to our lives, and we expect some occurrences to be left without explanation. 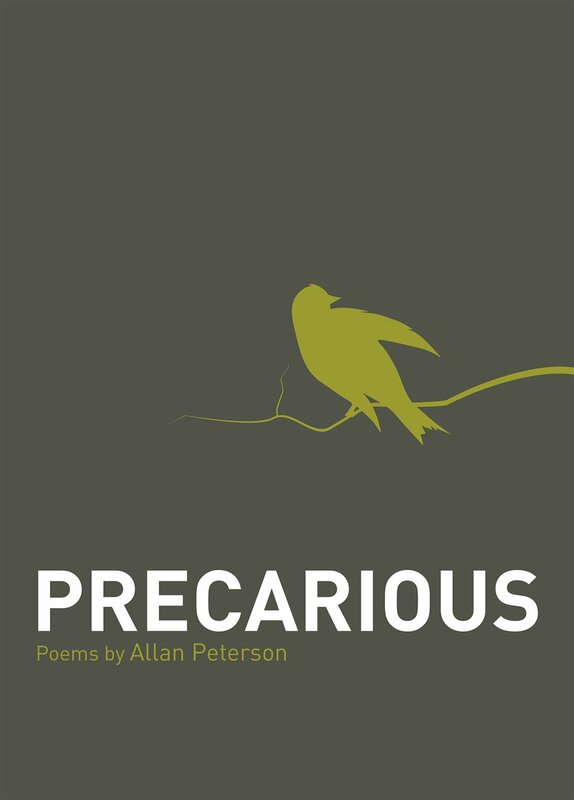 For instance, when we imagine something as being precarious, we think of its synonyms, something that is “insecure” or “dependent on chance”—something “dangerous”—and perhaps that is Allan Peterson’s point in the titling of his collection, Precarious. These poems are rooted in the exploration of connection—of the identity, of connection through the landscape (via geographical exploration) and one of heritage. What’s more, Peterson’s poems are passionate in their study of these elements, as well as images and the greater concept of isolation, particularly as it relates to a narrator searching. I love these poems, their introspective nature on the external, the inevitability of it, and, of course, their deeply-intellectual involvement with image. I will admit, it took several readings for me to feel as if I were truly grasping the sensation of these poems—not for lack of interest, but for their intellect. We say this often about poetry, but truly, these poems are layered; they appear to spend their time in the act of observation and introspection, and they surely do spend time here, but they are also greatly involved in considering our connections across landscapes and heritage, and consider how little we can do in forbidding these connections; these poems, in the end, suggest that these connections cannot be severed but only realized and built upon. That is an ultimate challenge for our humanity—realizing what we are, knowing what we cannot change, and ultimately, making the best of it. Then, when we are able to mobilize that idea, and bring it to something as visual and feeling as poetry, that seems to be a step in the right direction. I love this series of images and their relationship—how one element remembers another, impersonates another, and how we connect deeply to, both, the natural and the mechanical elements around us. It truly is impossible to avoid earthy relations, which are both beautiful their lasting and troublesome in their loss, but they also help to define us, what is important to us—in this case, the outdoors, nature, the ability to travel; it’s telling. And Peterson’s poems naturally work in this fashion, giving us snippets of understanding, giving us man-made locators, such as a Hardee’s or a Books-A-Million, or more natural, if man-named, places like the Carolinas, as well as creatures we coexist with, dogs and stingrays… Despite the time we appear to sit fixed, thinking about the message and sentiment of these poems, we are actually firmly surrounded by living beings and goings-on, all the time, on every page. It’s astounding, really, even a feat to have been captured. Which brings me to another element I found myself returning and returning to—as I started referring to them, mile-markers, places the narrator has been that more easily locate the reader to a place, if a not a time, and there’s that unusual element of elevated connection to another human being when we discover that they, too, have been out of town to a particular spot—how we suddenly have something more to talk about, a new point of insight. And these idea is interweaved into some, if not many, of Peterson’s poems, through his references to particular geographical landmarks, store and dining locations, and even pop culture. While some writers may steer clear of such references, fearing whether or not they will bring a heightened awareness or cloud the sentiment of the poem with other references, Peterson uses these fearlessly, and they become more so the side commentary that might appear in a conversation of another subject, contributing though not stealing focus. These small inclusions make for even more honest poems than they were originally, and they create for us references where the narrator has been in the body and where the narrator is currently in the mind. Because along with intellectualism and the act of reflection, there comes a certain amount of personal isolation. While these poems are lovely and explorative, there is an element of loneliness and perhaps even a certain of sadness, intertwined with observation and admiration. It reminds the reader of our and the world’s impermanence, as well as the questionable nature of identity, after-life and religion. In giving these poems the opportunity to connect through relatable and familiar places, references and acts, the reader is given a greater opportunity to relate, and while this does not occur in the poems themselves, there is a suggestion of evolvement on the part of the narrator, as readers “get to know” the speaker through reader, introspection and familiarity with references. Allan Peterson handles writing about extremely sensitive and personal topics—the things that most shape us—with surprising ease and continuation. While I have focused more so on the value of the image and the connections made to readers on the part of the narrator, these poems also do beautiful work in answering questions about the role of heritage and a higher power in our beliefs, everyday lives and identity. These poems are complex, imagistic and feeling, and there are beautiful parallels of self and sea, natural and man-made places. These poems take time, patience and thought, but they are well-worth it. You read them, and you find yourself sinking, taking it all in, and you come out on the other side all the wiser. These are poems that should not be missed; take the time to read them; they’re worth it. And before I go, I would like to share with you two of my other top-favorite Precarious poems, because they deserve and need to shared with more readers, and interestingly-enough, they are placed in close proximity to “Heat Escaping through My Head,” right at the book’s center. Cheers. catching urgency from whatever state I call. attentive, but with extra dogs. Autotomy in spiders is a voluntary act. that idled all night in the Hardee’s parking lot. only potentially there, things attached for survival. bathers spun down to on a single string. us leaving our pennies where they fall. meaning don’t forget us, we are leaving things behind. 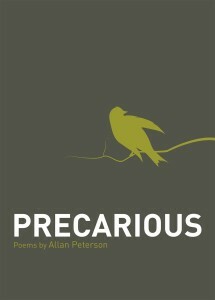 “The way poetry evokes things / only potentially there” is taken from Allan Peterson’s poem, “Don’t Forget Us,” as it appears in Precarious (42 Miles Press, 2014). ALLAN PETERSON is a visual artist and poet living in Gulf Breeze, Florida, and Ashland, Oregon. His poetry has appeared widely in print and online literary journals. He has published five full-length collections and seven chapbooks. Honors include fellowships from the National Endowment for the Arts and the State of Florida and ten nominations for Pushcart Prizes, as well as a variety of poetry prizes and appearances in anthologies. He also has a lengthy record of visual work in national, regional and invitational exhibitions. His mixed media work has been represented in corporate, university and private collections.